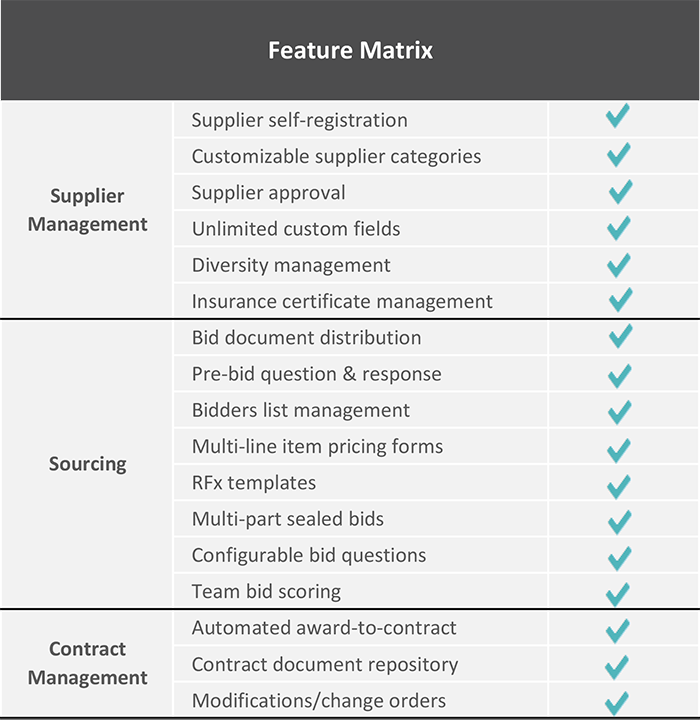 ProcureWare is an integrated procurement system for supplier management, e-sourcing, and contract management that gives organizations the tools they need to drive process efficiency and cost savings throughout the enterprise. Powerful enough for the core procurement team and simple enough for use in a de-centralized procurement organization, ProcureWare brings procurement processes out of the shadows to create measurable savings. The ProcureWare e-procurement platform is an easy-to-use, affordable, and customizable software-as-a-service solution used by large and small businesses and government procurement organizations. Simplify supplier management with a centralized system for supplier self-registration, pre-qualification, and bid notifications. Gain visibility of relevant supplier information to improve risk management and procurement decisions.